Be the first to share your favorite memory, photo or story of Eduardo. This memorial page is dedicated for family, friends and future generations to celebrate the life of their loved one. 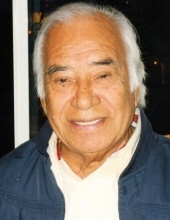 Eduardo Castillo, 96, a 41 year resident of Palm Springs, passed away April 6, 2019. Born February 23, 1923 in Guatemala. He was a loving provider, Father and Grandfather. Owner of Eduardo’s Fish Looie Restaurant and was an Executive Chef at Melvyn’s Ingleside Inn. Preceded in death by beloved wife, Syble, in 2002. Survived by children; Janice Cramer, Jerry Castillo, Terri McElroy, Kellie Castillo along with numerous grandchildren and great-grandchildren. To send flowers or a remembrance gift to the family of Eduardo Contreras Castillo, please visit our Tribute Store. "Email Address" would like to share the life celebration of Eduardo Contreras Castillo. Click on the "link" to go to share a favorite memory or leave a condolence message for the family.